The retailing world is changing in ways that are impacting all sorts of iconic brands. Warren Buffett, the founder of Berkshire Hathaway (BRK-A, BRK-B), says this helps to explain problems at Kraft Heinz (KHC). Last month, the company posted a surprise net loss due to a massive $15.4 billion non-cash impairment charge mostly tied to the Kraft and Oscar Mayer brands. Since that time, shares of Kraft Heinz, which Berkshire holds, have fallen nearly 34% and were last trading near an all-time low. But was that investment a mistake? Berkshire Hathaway owns 325.6 million shares of Kraft Heinz, a stake worth nearly 27% of the company. At the beginning of the year, that position has been worth just north of $14 billion. Based on Friday’s share price close, it’s now worth $10.4 billion. In the annual letter, Buffett said the position had a cost basis of $9.8 billion. “When we started out, it was originally a non-public partnership between us,” Buffett said. “But we did pay too much, in my view, for Kraft. And there's not much you can do about things, if you paid too much." Kraft Heinz faces challenges on multiple fronts including the rise of cheaper private-label brands and consumers no longer staying loyal to brands like they once did. Besides ketchup and boxed macaroni and cheese, the Kraft Heinz portfolio of packaged foods and beverages includes Lunchables, Philadelphia cream cheese, Kool-Aid, Capri Sun, Jell-O, and Maxwell House coffee to name a few. One of the widely-discussed challenges in the consumer packaged goods space is evolving preferences for healthier, less-processed options. The other challenge that Buffett raised with Yahoo Finance is big-box retailers have been building out their private labels. Buffett pointed out that Costco (COST) attempted to stop stocking Coca-Cola (KO) on its shelves back in 2009 over a pricing dispute. “Costco's got terrific loyalty among customers, and their own Kirkland brand is a $39 billion brand now. And it moved from category to category, and they only started in 1992. So they know brands,” Buffett said. “But in the end, they put Coca-Cola back in. The 88-year-old investor characterized this as “a new retailing environment” with new approaches to advertising to a consumer who has shown flexibility when it comes to brand loyalty. He explained it’s a different world with people more open to changing brands. Buffett's investment in Kraft Heinz dates back to 2013 when 3G Capital, a firm led by Buffett's friend Jorge Paulo Lemann and associates Alex Behring and Bernardo Hees, asked Berkshire to team up as a financing partner to buy a majority interest in Heinz. "In that role, we purchased $8 billion of Heinz preferred stock that carries a 9% coupon but also possesses other features that should increase the preferred’s annual return to 12% or so. Berkshire and 3G each purchased half of the Heinz common stock for $4.25 billion," Buffett wrote in the 2013 annual letter. At the time, Buffett acknowledged that the deal resembled a private equity transaction, but that Berkshire "never intends to sell a share of the company." "What we would like, rather, is to buy more, and that could happen," he wrote at the time. In 2015, Heinz merged with Kraft. Prior to that deal, Berkshire owned about 53% of Heinz at the cost of $4.25 billion. After the merger, Berkshire owned 325.4 million shares of Kraft Heinz that cost about $9.8 billion. "The new company has annual sales of $27 billion and can supply you Heinz ketchup or mustard to go with your Oscar Mayer hot dogs that come from the Kraft side. 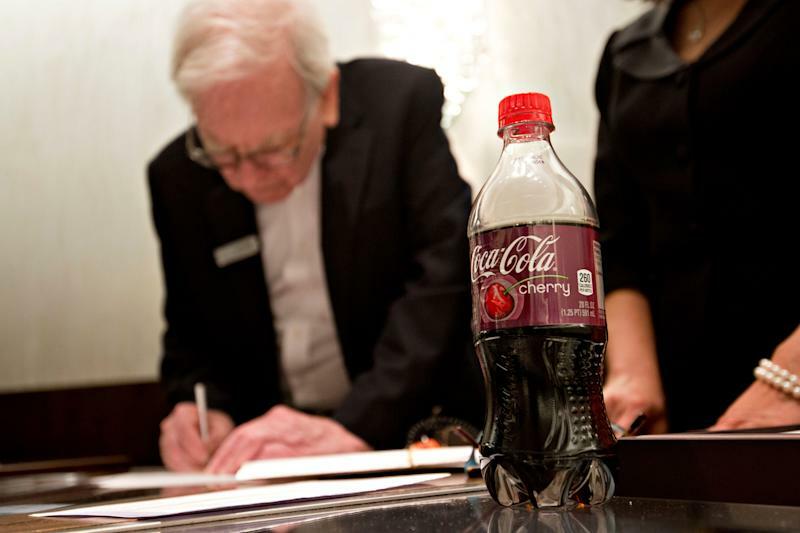 Add a Coke, and you will be enjoying my favorite meal," Buffett wrote in the 2015 annual shareholder letter. Julia La Roche is a finance reporter at Yahoo Finance. Follow her on Twitter.